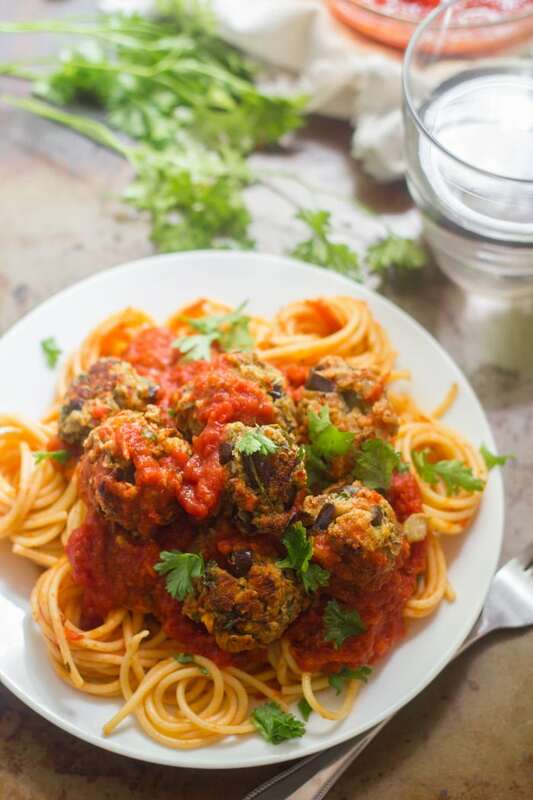 These vegan eggplant meatballs made with tender sautéed eggplant, crispy panko breadcrumbs and Italian seasonings, smothered in rich tomato sauce. I promised a while back to provide some recipes to go with my marinara sauce. Of course, the obvious choice would be any kind of pasta, but I like to be a little more creative than that. These “meatballs” are great on their own, served aside a big plate of pasta, on a sandwich, on top of a big mound of garlicky greens…you get the idea. A versatile vegan side or main dish. Whatever you’re into! I have my grandfather to thank for this one. He’s an excellent Italian cook. At some point during my teens he invited the whole family over for a big pasta dinner. I figured there’d be meat involved, but that wasn’t an issue for me. I was happy eating pasta, salad, bread, or whatever other non-meat items came along with the dinner. But my grandfather decided to be extra accommodating. 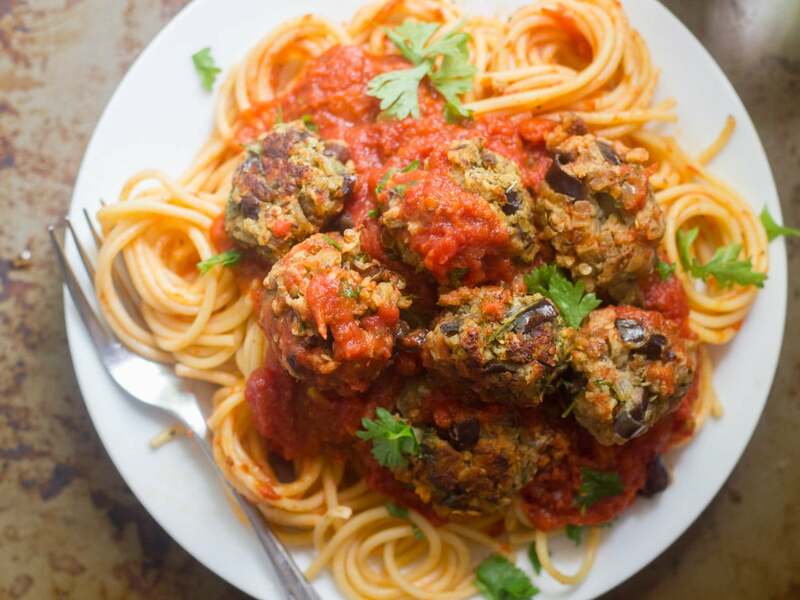 When I arrived he was cooking up a version of these eggplant meatballs. He’d seen them prepared on a cooking show and thought he’d give them a shot for me. He looked a little downcast and informed me that he didn’t think they turned out right. I tried one and informed him that he was sorely mistaken — they were awesome! I think he expected them to be meatier, since they were intended to be a vegetarian version of meatballs. What actually came out, to my tastebuds at least, was more like an eggplant Parmesan flavored ball of vegetarian goodness! 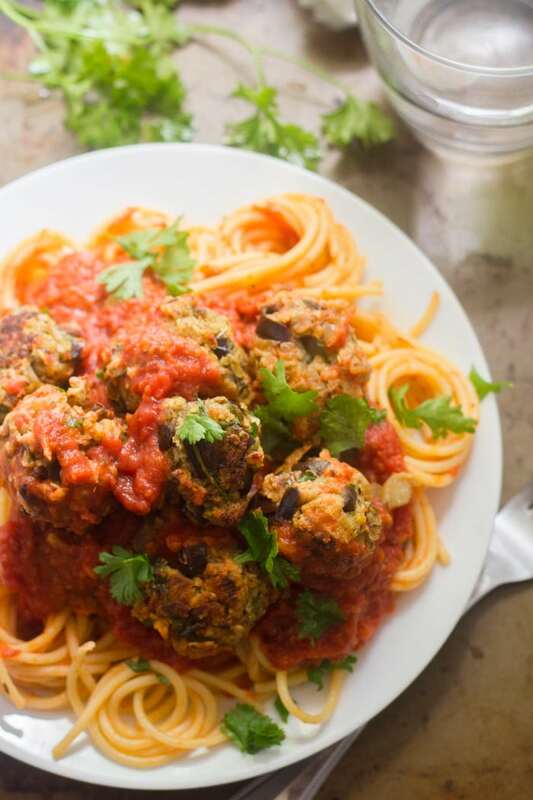 I happily enjoyed my eggplant meatballs alongside my pasta that night, and took the leftovers home to make an amazing eggplant meatball Parm grinder. Whisk the flax seeds and water together in a small bowl, then allow the mixture to sit for at least 10 minutes. While the flax mixture sits, heat 1 tablespoon of olive oil in medium skillet over medium heat. Add the onion and sauté until soft and translucent, about five minutes. Add the garlic and continue to sauté until very fragrant, about 1 minute more. Add the eggplant and continue to cook for about an additional 10-15 minutes, flipping occasionally, or until the eggplant is soft and browned in spots. Allow to cool. Preheat the oven to 375° and coat a baking sheet or large cast iron skillet with the remaining tablespoon of oil. Place the eggplant mixture into a large mixing bowl, along with the flax mixture, and stir in all remaining ingredients. Mix well (hands work great here), and then shape the mixture into 1-inch balls (about 20 of them). Arrange the meatballs on the baking sheet or in the skillet and bake for 30-35 minutes, turning once or twice during baking in order to brown all sides. While these are great served with sauce, I don't recommend storing or letting them sit in the sauce for too long, as they're pretty delicate and will fall apart. These look really hearty. I bet they would freeze well! I might try making a double batch next time and freezing half! Awe…thank you and doubly thank you!!! Both wonderful compliments…you totally just made my day! Yum!! How many did you get from this? I’d love to serve it for Christmas Eve to our Italian family! I made these tonight and they were absolutely delicious! 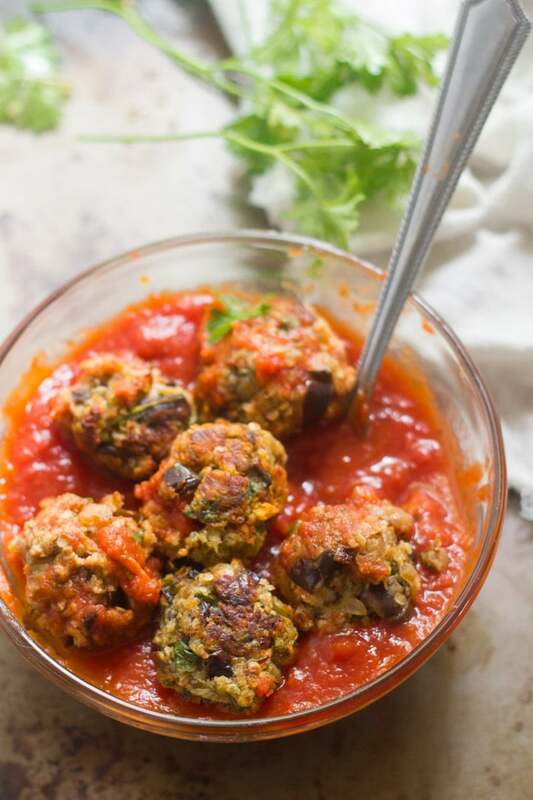 I grew up on my Italian Grandpa’s meatballs but recently went vegan, I’d be totally okay eating these for the rest of my life. Thank you for the recipe! You’re welcome! So glad they worked out for you, and thank you so much for sharing. I love hearing how my recipes turn out for others, and of course, success stories always make me very happy! I want to make this! I love eggplant and my mom makes something close to this but she uses whole (small size) eggplants and uses indian cooker to boil/steam it. And, this looks awesome. Def. will make it. love it! Thank you! I was thinking of trying this out with some different eggplant varieties. Steaming sounds good as well. Hope you enjoy them!!! So I totally cheated and I decided to chop up some LightLife italian “Smart Sausages” (2 links) which I had in the fridge and throw that in – oh and I used nutritional yeast powder instead of flakes, but other than that I followed everything else in the recipe and oh man were these good!! Fabulous recipe! Will definitely make again! Hi ! May I have your recipe for the homemade Marinara Sauce please?? I would LOVE to see an independent print button. It’s a pain to have to copy and paste recipes into another program and then print it from there. I don’t know if it costs more but PLEASE! This recipe looks SOOOO super yummy! I am going to C&P it and then print it and make it for dinner tonight. I have eggplant and was going to make eggplant “parm” but I think I’ll make this instead! I REALLY appreciate your recipes! Being vegan in this new technological age I think is probably a lot more satisfying than ten to fifteen years ago!! If I missed your print button, feel free to scold me, sometimes I miss them. Update – I just added a print button! I did this recipe and my most recent post. I’ll be including one in all posts going forward and hopefully get around to putting one into all my old recipes. Your blog is awesome! Thank you so much for sharing this recipe, Alissa. I’ve made it yesterday and it turned out really well. I left out the parsley as I’m not a bit fan of it, next time I might try to add fresh mint instead. love all of your sushi ideas! sub’d out for GF oats pulsed a bit in a Vitamix? Thank you! I can’t say for sure, but that might be worth a shot. The texture might be a little different, but I think they should still be tasty. I’ve also seen gluten free panko around, so they might be worth a shot as well. Enjoy! crisper :( Once again, as a fairly new vegetarian, I appreciate yours and all these great vegetarian/vegan blogs. Thank you. I’ve never actually used canned eggplant, but you got me curious so I just looked it up on Trader Joe’s website. From what I can gather, it’s already cooked and seasoned, so you might need to adjust the recipe but cutting out the eggplant cooking step and adjusting the seasonings. I can’t say for sure, but I’m guessing with a little tweaking here and there you could get it to work. I wish I could give you a more definite answer – like I said though, you got me curious, so I might just get around to experimenting with that myself! Any suggestions on what to substitute for the flax seeds and water? I am out of them and can’t get to the store. They replace eggs, so you could use an egg if you aren’t vegan, or experiment with other egg substitues like chia seeds + water or commercial egg replacer. I haven’t tried any of these things myself, so I can’t say for sure, but I think they’d work. I’m going to try this soon, I think instead if serving them alone I think I will make some eggplant noodles and some zucchini noodles toss those together then add these meatballs with some marinara sauce. Sounds yummy!!! That sounds delicious! I hope you enjoy it! I made it tonight and it was delicious even my meat loving husband went back for seconds!!!!! Hi Alissa, Usually I surf around the net to a bunch of sites but lately I’ve been making your recipes exclusively. Thank you so much for all the inspiration. 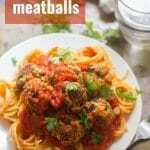 I made these tonight along with your sauce and added some fennel to the balls.Great dinner! Hi Marry! Thank you so much! I’m so glad to hear that you’re enjoying the recipes, and that you like the meatballs! I LOVE fennel and will have to try including some next time I make these! Oh, and some fennel…about 3/4 tsp. ground. Wow! Those all sound like delicious additions! I’m glad you enjoyed them! Amazing! I ended up throwing everything into a food processor after cooking & cooling the eggplant, onion & garlic, and then just blending it all together. SO flavorful! Wow!